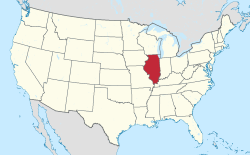 Berwyn /ˈbɜːrwɪn/ is a suburban city in Cook County, Illinois, coterminous with Berwyn Township, which was formed in 1908 after breaking off from Cicero Township. As of the 2010 census, the city had a total population of 56,657. In 1846, the first land in "Berwyn" was deeded to Theodore Doty who built the 8-foot-wide (2.4 m) Plank Road from Chicago to Ottawa along the Ottawa Trail. The trail had been used as a French and Indian trade route and more recently as a stage coach route to Lisle. This thoroughfare became what is now Ogden Avenue in South Berwyn. In 1856, Thomas F. Baldwin purchased 347 acres (1.40 km2) of land, bordered by what is now Ogden Avenue, Ridgeland Avenue, 31st Street, and Harlem Avenue, in hopes of developing a rich and aristocratic community called "LaVergne". However, few people were interested in grassy marshland. Mud Lake extended nearly to the southern border of today's Berwyn, and the land flooded regularly during heavy rains. The only mode of transportation to LaVergne was horse and buggy on the Plank Road. However, the financial panic of 1873 and Baldwin's death in 1876 stunted the growth of LaVergne. Baldwin's daughter, Emma, inherited her father's estate, and in 1879 she sold most of the land to a group of realtors controlled by Marshall Field. The new development enacted building codes and stipulated the minimum building cost of each home. By the end of 1880, 12 new homes were built. By 1888, the settlement had grown so much that the Baldwin family donated the triangular piece of land bounded by Ogden Avenue, 34th Street, and Gunderson Avenue so that a school could be built. LaVergne School became the first public building in Berwyn. In 1890, Charles E. Piper and Wilbur J. Andrews, two Chicago attorneys, purchased a 106-acre (0.43 km2) plot of land from the Field syndicate to develop. The land was bounded by Wesley, Kenilworth, 31st Street, and Ogden Avenues. By the following year, the two received approval from Cicero Township to double their land holdings. Piper and Andrews wanted the railroad to build a station in their development, but the railroad already had stations at La Vergne and at Harlem Avenue. Piper and Andrews decided to build a station with the understanding that trains would stop regularly. They did not know what to name their station so they consulted a Pennsylvania train timetable to find a name. The name they chose was Berwyn, a beautiful subdivision outside of Philadelphia. After 1901, all settlements in the area were known as Berwyn. While Piper and Andrews were developing the southern portion of present-day Berwyn, John Kelly was helping to develop the north part from 12th Street to 16th Street. This area was really a part of an Oak Park subdivision, and it even appeared on some maps as "South Oak Park". In fact, children who lived in this area went to school in Oak Park. John Kelly was known as "Mr. Everything" because he was a realtor, builder, insurance seller, and community servant. During this time, Berwyn was the area's fastest growing suburb. The city's stringent building codes resulted in block upon block of well-built brick two-story bungalows. Many also contained elaborate design elements typically not seen, such as stained glass windows, clay tile roofs, terra cotta, and intricate brick patterns. Today, Berwyn is noted as having the most significant collection of Chicago-style bungalows in the nation. For the period 2009-11, the estimated median annual income for a household in the city was $50,388, and the median income for a family was $55,946. Male full-time workers had a median income of $42,099 versus $34,989 for females. The per capita income for the city was $20,143. About 12.5% of families and 14.5% of the population were below the poverty line, including 19.9% of those under age 18 and 11.8% of those age 65 or over. According to the 2010 census, Berwyn has a total area of 3.91 square miles (10.13 km2), all land. Bordering suburbs include Oak Park to the north, Cicero to the east, Stickney to the south, and Lyons, Riverside, and North Riverside to the west. Geologically, Berwyn is predominately composed of Glacial Lake Bottom from the Wisconsin Glacial Episode, the most recent glacial period. A beach ridge of sand and gravel, made during one of the stages of Lake Chicago, is also present in the city. This is most easily identified as Riverside Drive. The elevation change due to the ridge is clearly seen on the 2800 block of Maple Ave. Prior to the settlement of Berwyn, the land was grassy marshland. The body of water that connected the South Branch of the Chicago River to the Des Plaines River was a shallow waterway or a muddy slough (depending on the season) known as Mud Lake. Mud Lake extended nearly to the southern border of today's Berwyn, and the southern end of Berwyn flooded regularly during heavy rains in its early years. The City of Berwyn operates under a Strong Mayor form of government. The people of the Berwyn elect the mayor, clerk, treasurer, and one alderman from each of the city's eight wards. The terms of elected officials are four years. The mayor is given administrative authority, and he has the power to appoint and remove all officers of the municipality, except those covered by civil service. The City Council, composed of the eight aldermen and the mayor, is the legislative organ of the city. Since 2013, Berwyn has been split between three of Illinois' congressional districts: the 3rd Congressional District, 4th Congressional District, and 7th Congressional District. The United States Postal Service operates the Berwyn Post Office (1940), at 6625 Cermak Road. The post office contains a mural, The Picnic, painted in 1942 by Richard Haines. Murals were produced from 1934 to 1943 in the United States through the Section of Painting and Sculpture, later called the Section of Fine Arts, of the Treasury Department. Berwyn North School District 98 comprises 4 schools: Havlicek Elementary, Prairie Oak Elementary, Jefferson Elementary, and Lincoln Middle School. Berwyn South School District 100 comprises 8 schools: Emerson Elementary, Hiawatha Elementary, Irving Elementary, Komensky Elementary, Pershing Elementary, Piper Elementary, Freedom Middle School, and Heritage Middle School. High school students, depending on residency, attend either J. Sterling Morton High School District 201's J. Sterling Morton High School West in Berwyn or J. Sterling Morton High School East in Cicero. Most areas are west of Ridgeland Avenue and therefore are zoned to Morton West, while those east of Ridgeland Avenue are zoned to Morton East. The third one, St. Mary of Celle, closed after the 2004–2005 school year. The building and premises are still used though. During the Depression, the tuition at St. Odilo was only 75 cents (about $13.77 when accounting for inflation). Parochial grade school students who wish to move onto parochial secondary education can attend nearby schools such as Fenwick High School in neighboring Oak Park, St. Joseph High School in Westchester, or Nazareth Academy in La Grange Park, all of which are co-educational. Trinity High School located in River Forest is a school for girls. LaVergne School, built in 1888, was the first school built in Berwyn, the building had two classrooms with fireplaces. Despite community protest, the 50-year-old building was torn down in 1938. It was replaced with the Lavergne Education Centre which, once an elementary school, is now the headquarters of the Berwyn South School District 100. While Berwyn is known as the "City of Homes", it also contains four primary business corridors: Ogden Ave, the Depot District, Cermak Road, and Roosevelt Road. Ogden Ave, a segment of historic Route 66, is an automobile-centered district, and at its peak the road included over a dozen car dealerships in Berwyn. The Depot District, the area around the train station, includes an array of independent shops and restaurants. MacNeal Hospital, the city's largest employer, is at the center the district. Cermak Road earned the nickname "The Bohemian Wall Street" due to the many savings and loans located there. In 1991, the Chicago Sun-Times reported that "Berwyn has the highest concentration of financial institutions in the world - a tribute to the frugality of its forebears." The savings and loan crisis of the 1980s hit the area especially hard. The Cermak Plaza Shopping Center, which opened in 1956, is located at the corner of Harlem Avenue and Cermak Road. Notable original tenants included J. C. Penney, Walgreens, F.W. Woolworth, Kinney Shoes, Jewel Foods and Fannie May Candies. Cermak Plaza served as the main shopping center for the area until 1975 when the North Riverside Park Mall opened a half mile west on Cermak Road. Current tenants include Meijer, Marshalls, Party City, K&G, Office Depot and Dollar Tree. Cermak Road now includes an array of retail shops and restaurants. Roosevelt Road is home to several music venues, include FitzGerald's Nightclub. Berwyn is served by the BNSF Railway Line, and Metra operates three stations within the city: the Harlem Avenue Station, the Berwyn Station at Oak Park Ave, and the La Vergne Station at Ridgeland Ave. The Illinois Central Railroad is the second Berwyn railroad the continues to operate to this day. The line between Chicago and Freeport, IL was constructed between 1886 and 1888 by the IC subsidiary Chicago, Madison, and Northern Railroad. 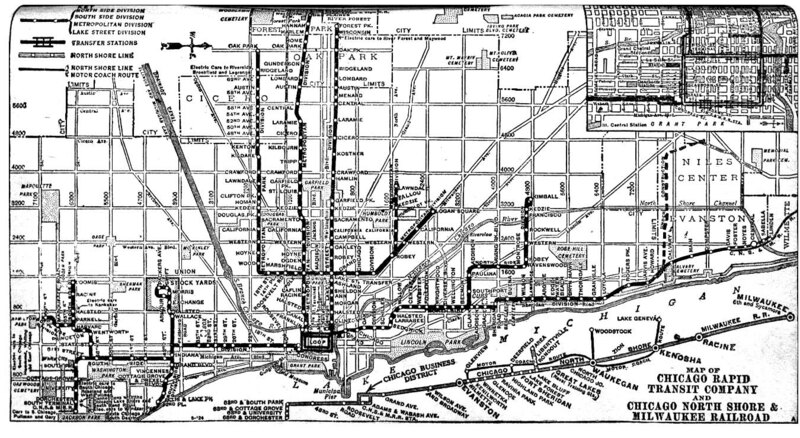 Commuter service between Chicago and Addison was offered until 1931. A train station was located in Berwyn just east of Oak Park Ave. During the 1940s the Illinois Central provided intercity travel as far as Sioux City. Trains would depart from Chicago Central Station. The Iowan and Hawkeye traveled to Sioux City, while the Land 'O Corn ran to Waterloo and the Sinnissippi to Freeport. Passengers from Berwyn could make a flag stop for the Sinnissippi The station was removed from service in the 1950s. During the 1950s and 1960s the Hawkeye continued to provide passenger service between Chicago Central Station and Sioux City on the line. Amtrak operated the Black Hawk service between Chicago and Dubuque from 1974 to 1981. Today the route is used solely for freight traffic. Until 1952 Berwyn was served by the Douglas branch of the Chicago "L". The line was extended in 1924 to Oak Park Ave, just North of Cermak Rd. In 1952 rail service west of 54th Ave was suspended and replaced by bus. The fairways that once served as the right of way for the "L" still exist as parking lots for shopping along the Cermak avenue corridor. Berwyn now has a growing arts community with a professional equity theater, an Arts Council and music and entertainment venues. Ogden Avenue is part of the "Historic Route 66" in Berwyn, and an annual Vintage Car Show has taken place in the city every year in early September since 1990. Ogden Avenue is closed to traffic from Ridgeland to Oak Park Avenue, and hundreds of car enthusiasts come out to celebrate the spirit of Route 66. In 2006, Berwyn began to host its annual art car parade called Cartopia. Art car artists from all over the country meet to show off their latest creations and then parade through the neighborhood. In the 1960s and 1970s, many Italian families moved into Berwyn. The Maria SS Lauretana Italian-Sicilian Religious Festival was held on the grounds of Morton West High School during Labor Day weekend until 2014. Berwyn was notable for the sculpture Spindle, created by artist Dustin Shuler and located in the Cermak Plaza shopping center along with other works of art. The Spindle was shown in the movie Wayne's World. It was demolished and scrapped on the night of May 2, 2008 to make way for a new Walgreens. Grassroots efforts to Save the Spindle failed to raise the $300,000+ that it would have taken to dismantle and relocate it. This was a major upset among supporters of the sculpture, considering that it did not encroach upon the new Walgreens' final location. The two topmost cars were placed in storage; as of 2012[update] the Berwyn Route 66 Museum on Ogden Avenue proposes to incorporate them into a reconstruction of the Spindle. Portions of the 2008 film Wanted with Angelina Jolie were filmed at Cermak Plaza. Segments of the films A League of Their Own and Adventures in Babysitting were filmed at FitzGerald's Nightclub in Berwyn. Berwyn is a very diverse community, with some larger homes on its south side and many smaller, bungalow-type homes on the north side around Roosevelt Road and Cermak Road. The town also has many duplexes and three unit buildings. Because of the predominance of small residences in Berwyn, the community has an unusually low carbon footprint. According to data published by the Center for Neighborhood Technology, Berwyn had the lowest per capita CO2 emissions from homes and private vehicles in the Chicago area. The Berwyn Eagles Club is a small venue that plays host as a bingo hall as well as an arena for monthly professional wrestling events held by All American Wrestling, which is considered[according to whom?] to be one of the top independent pro wrestling companies in the Midwest. Horror host Rich Koz, aka Svengoolie, regularly comments on "beautiful Berwyn" as a long-running gag on his Chicago TV show. Wikimedia Commons has media related to Berwyn, Illinois. ^ a b "Geographic Identifiers: 2010 Demographic Profile Data (G001): Berwyn city, Illinois". U.S. Census Bureau, American Factfinder. Retrieved February 7, 2013. ^ "The Chicago Portage - Historical Synopsis | Chicago Portage". drupal.library.cmu.edu. Retrieved 2017-09-05. ^ "Ogden Avenue … Street with a Real History | Western Springs Historical Society". www.westernspringshistory.org. Retrieved 2017-09-05. ^ a b c d "About Berwyn - City of Berwyn". ^ Chicago Tribune (27 June 2015). "Berwyn bungalows one step closer to national historic recognition - Chicago Tribune". chicagotribune.com. ^ "2010 United States Census Data". ^ a b "Profile of General Population and Housing Characteristics: 2010 Demographic Profile Data (DP-1): Berwyn city, Illinois". U.S. Census Bureau, American Factfinder. Retrieved February 8, 2013. ^ "Selected Social Characteristics in the United States: 2009-2011 American Community Survey 3-Year Estimates (DP02): Berwyn city, Illinois". U.S. Census Bureau, American Factfinder. Retrieved February 8, 2013. ^ "Selected Economic Characteristics: 2009-2011 American Community Survey 3-Year Estimates (DP03): Berwyn city, Illinois". U.S. Census Bureau, American Factfinder. Retrieved February 8, 2013. ^ "Illinois State Geological Survey Surficial Geology of the Chicago Region: Berwyn Quadrangle | ISGS". www.isgs.illinois.edu. Retrieved 2017-09-04. ^ "Local Government | City of Berwyn". www.berwyn-il.gov. Retrieved 2017-09-04. 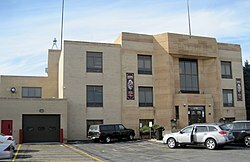 ^ "Fire Department | City of Berwyn". www.berwyn-il.gov. Retrieved 2017-09-04. ^ "Congressional District Maps". www.cookcountyclerk.com. Retrieved 2017-09-04. ^ "Post Office Location - BERWYN." United States Postal Service. Retrieved on April 17, 2009. ^ "Post Office Mural, Berwyn, IL". livingnewdeal.org. Living New Deal. Retrieved 10 October 2015. ^ "1950s." J. Sterling Morton High School East. Retrieved on December 20, 2016. ^ "Polling Locations for March 2012." Stickney Township. Retrieved on December 20, 2016. ^ Berwyn?, Why. "Historic Route 66 - Ogden Avenue | Why Berwyn?". www.whyberwyn.com. Retrieved 2017-09-04. ^ Pleasant Family Shopping: The Art and History of Cermak Plaza. Pleasantfamilyshopping.blogspot.com (2010-02-02). Retrieved on 2013-07-21. ^ Renovation spurs revival at Cermak Plaza. Rejournals.com (2011-02-16). Retrieved on 2013-07-21. ^ Berwyn?, Why. "Cermak Road - Berwyn's Main Street | Why Berwyn?". www.whyberwyn.com. Retrieved 2017-09-04. ^ "Comprehensive Annual Financial Report For the Year Ended December 31, 2013" (PDF). City of Berwyn, Illinois. December 31, 2013. ^ "The Illinois Central Railroad". American-Rails.com. Retrieved 2017-09-05. ^ a b "CHICAGO'S LOST STATIONS". www.chicagorailfan.com. Retrieved 2017-09-05. 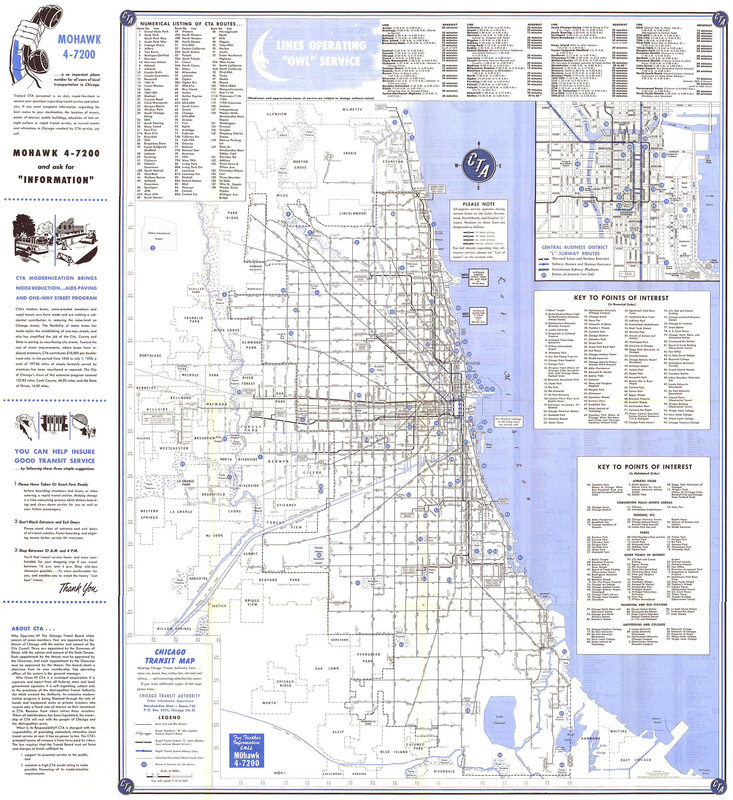 ^ "Illinois Central Timetable - 1967". www.thejoekorner.com. Retrieved 2017-09-05. ^ "Black Hawk brochure, 1974. — Amtrak: History of America's Railroad". history.amtrak.com. Retrieved 2017-09-05. ^ Know Chicago - Shealy's New Idea Street Guide for Quick Service (Map). J.P. Shealy Street Guide. 1925. Retrieved 2013-08-18. ^ Chicago Transit Map (Map). Chicago Transit Authority. 1954. Retrieved 2013-08-18. ^ "WEST TOWNS RAILWAY MAP". www.chicagorailfan.com. Retrieved 2017-09-05. ^ "Welcome to the Shore Line Interurban Historical Society | 1902 Crossing Dispute". www.shore-line.org. Retrieved 2017-09-10. ^ LLC., Historic Map Works. "Cook County 1913 Cicero Township Illinois Historical Atlas". www.historicmapworks.com. Retrieved 2017-09-05. ^ "Houby Day Festival & Parade". Everfest.com. ^ "Berwyn Arts Council Launches First Annual Cartopia Event". 2006 PR Newswire Association LLC. 2006 PR Newswire Association LLC. May 23, 2006. ^ Subak, Susan (2018). The Five-Ton Life. pp. 123–125. ^ Reader's Digest, May 2006, p. 94. ^ "World's Largest (Solar) Laundromat" Re-opens!". Illinois Government News Network. State of Illinois. January 21, 2006. Retrieved July 8, 2007. ^ Okuda, Ted; Yurkiw, Mark (2007). Chicago TV Horror Movie Shows: From Shock Theatre to Svengoolie. Lake Claremont Press. p. 118. ISBN 978-1893121133. Perhaps the show's most famous catchphrase is...the pained cry of 'Berrrrr-wyn?' groaned by a chorus of off-camera voices and cued every time the Chicago-area suburb is mentioned.